Samsung Electronics, a world leader in advanced digital component solutions, today announced that its Programmable Multichannel Driver (PMD) has been selected as the top enabling technology of the year at the 2017 Lux Awards. Since 2010, the Lux Awards has been recognized as one of the most prestigious honors for lighting component manufacturers and customers who have significantly improved the global lighting environment, reduced energy consumption or achieved major technological advances of importance to users worldwide. Samsung’s PMD features two-channel driving, allowing luminaires to tune color temperature (CCT) and dim light output. For example, in order to control a luminaire with warm white and cool white modules, previously a separate driver was needed for each color temperature as well as a controller to connect the two drivers to a single dimmer. However, with Samsung’s award-winning PMD, a luminaire only needs to be wired to the PMD in order to fine-tune the CCT and control dimming in an exacting manner. This dual role adds to the simplicity and convenience of everyday lighting environments in an extensive number of applications ranging from commercial to architectural lighting. The PMD also supports DALI and 0-10V output ports, as well as the universal input voltage range for easy adoption throughout the global lighting market. Its programming software allows lighting system managers to easily adjust operating value settings, such as CCT, current and dimming levels, to create the most optimized lighting environments. 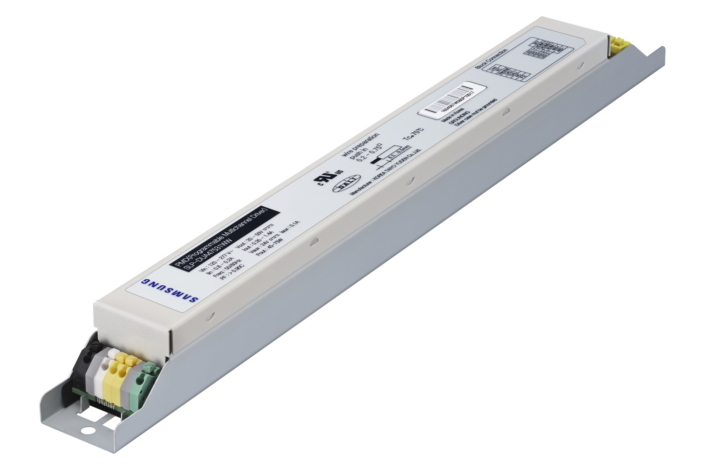 Samsung’s PMD has become a key element in a growing number of smart lighting systems as it can be quickly linked to a wide range of control modules and sensors through the use of a 24V auxiliary power supply, eliminating the need for an additional power source. Moreover, it can be adjusted in 1mA increments, enabling more efficient inventory management for luminaire manufacturers.